Airwheel intelligent self-balancing scooter S3 is a revolutionary personal transporter. Since its launch in October, Airwheel S3 has been upgraded with multiple functions and its battery range has been extended. Before getting yourself an Airwheel S3, you’d better get more ideas of the electric self-balancing scooter. Airwheel intelligent self-balancing scooter S3 debuts as a fresh alternative to those electric unicycle fans. Based on the same theory and gyro system, Airwheel S3 comes with 2 wheels and a vertically ascending handlebar and control shaft. In addition, its exterior is highlighted by a sportive Lamborghini light design, which makes a difference among similar products. 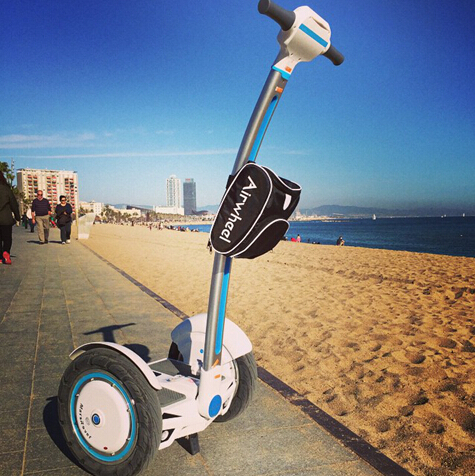 Operation mode: unlike the operation mode of electric unicycles, S3 self-balancing scooter (http://www.airwheel.net/)is controlled by both the body and handlebar. Just step on the foot platform, the unit will start to go forward, please relax at start and take time to get used on it. Airwheel intelligent self-balancing scooter S3 is equipped with dual backup systems, for better safety. Actually I never run into any sudden shut-down after one-month usage, so at least Airwheel’s driving system is a reliable and agile one. Powered by a premium motor, S3 self-balancing scooter delivers smooth and potent performance. It is said that the motor is independently developed by Airwheel R&D department, sometimes it even amazes me when it conquered a 15°slope without effort, btw, I weigh 70kg (154lbs) and I think it can carry at least a load of 220lbs. Besides, the whole vehicle is highlighted by the Bluetooth function, which can be connected with your smart phone to work as a stereo speaker no matter indoor or outdoor. In general, Airwheel intelligent self-balancing scooter(http://www.airwheel.net/)is a powerful personal transporter, which contributes to environment protection and your own style. Airwheel, keep going!